What is a Medicare Supplement Plan seems like a question that everyone knows the answer, but that is not the case. Get the facts of what a Medicare Supplement is, what it isn't and what it means to you. If you prefer to discuss you Medicare options, please call us at 844-528-8688. Continue reading for the facts of a Medicare Supplement Plan and compare rates for the top Medigap plans in your area. It seems a pretty simply question, "What is a Medicare Supplement Plan? ", but you would be surprised at how many people really do not know the actual answer. When people are starting Medicare for the first time, they get all kinds of advice from well meaning friends and family, but sadly most of that information is either untrue or only half true. With this article we will answer the question What is a Medicare Supplement Plan, and hopefully some others. This information will help you make an informed decision on what helps you in your situation. To put it simply a "true" Medicare Supplement Plan, is a plan sold by private insurance companies. In all but three states there are 10 Medicare Supplement Plans, all with varying benefits. The other three states use a series of riders that are attached to a base plan. The three states the do not follow the lettered system are Wisconsin, Minnesota, and Massachusetts. A Medicare Supplement plan is designed to cover the gaps in Medicare, in other words Medigap plans pay what Medicare does not pay. 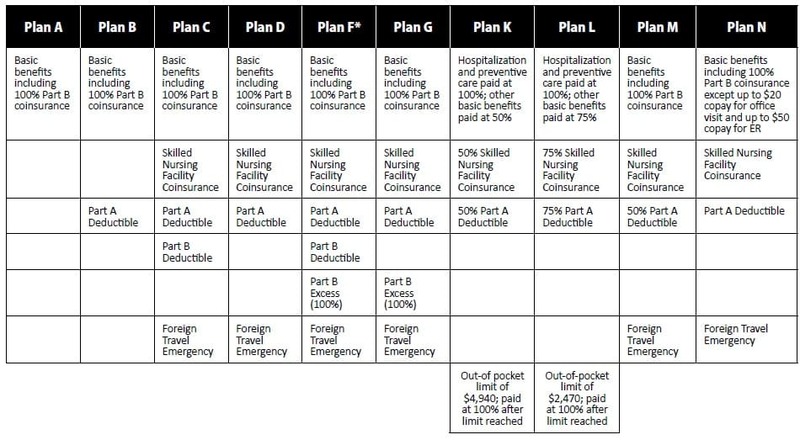 Depending which plan you choose it will cover deductibles, coinsurance, and copay's. Many people call their Medicare Advantage Plan, supplemental insurance or secondary insurance, this is incorrect. Medicare Advantage Plans are not Medicare Supplement Plans and they have very different benefits. Medicare Advantage Plans actually do not fill any gaps of Medicare, they instead gives the administration of your Medicare benefits to a private insurance company that is contracted with Medicare or CMS. They were at one time referred to as "Medicare Replacement Plans". With a Medicare supplement Plan, there are networks. You simply need to go to a doctor or facility that accepts Medicare and/or Medicare assignment. Any doctor anywhere in the United States that accepts Medicare. If they accept Medicare assignment, they will then accept Medicare pricing in full, if not, they can charge a 15% part B excess fee, but even this can be covered to a Medicare Supplement Plan. The price of a Medicare Supplement Plan will be calculated depending on several factors. The first of which is what plan you decide on. There is a very large price difference between the plan F and the Plan G and so on for each plan. The more benefits the more the cost. The premium for the same plan is charged regardless of age. Premium does not rise due to age, but goes up due to inflation or several other factors. When the rates do go up they will go up for everyone in that area that has the same plan regardless of age. Premiums are usually much higher when you are younger to offset the costs of no increase as you age. The cost when you first get your policy is normally lower for this type of plan. Did you notice that you health was never mentioned in the pricing? That is because your usage or your health is not a factor while you have a Medicare Supplement Plan. It can be used against you when changing plans but never while you are in a plan. There are a few different aspects that can affect pricing, such as household discount, spousal discount, tobacco usage and location. What is a Medicare Supplement Plan? Well, it is a Medigap, just another term for the exact same product. The term Medigap refers to the supplemental insurance purpose of filling the gaps that are not covered by Medicare. We hope we have answered the question "What is a Medicare Supplement Plan", but we know you may have questions. We are here for you and you can contact us several ways, call 844-528-8688, use our online chat in the lower corner of this page, or email us from our Contact Us Page.